Cuc Phuong has the area of 22.000 hectares, of which three quarters are limestone with height from 300 meters to 600 meters above sea level. Here, there has May Bac mount with 648.2 meters. The climate in Cuc Phuong is kind of tropical monsoon climate, average annual temperature about 24.70C. Especially, there have many caves, beautiful landscape and historical natural remnants such as: Trang Khuyet Cave, Chua Cave, Thuy Tien Cave, Nguoi Xua, Cave, Con Moong grotto, San Ho Cave. In the Park, there has hot spring 380C. The flora is various with 1.944 species. Diverse fauna includes 71 species of mammals, 300 species of birds, 33 reptiles and 16 amphibians. Besides, there has many animals such as: bears, horses, boars, tigers, leopards, ferrets, squirrels, monkeys… The half natural breeding area has deer, yellow monkey, Delacour’s langur and flying squirrel. 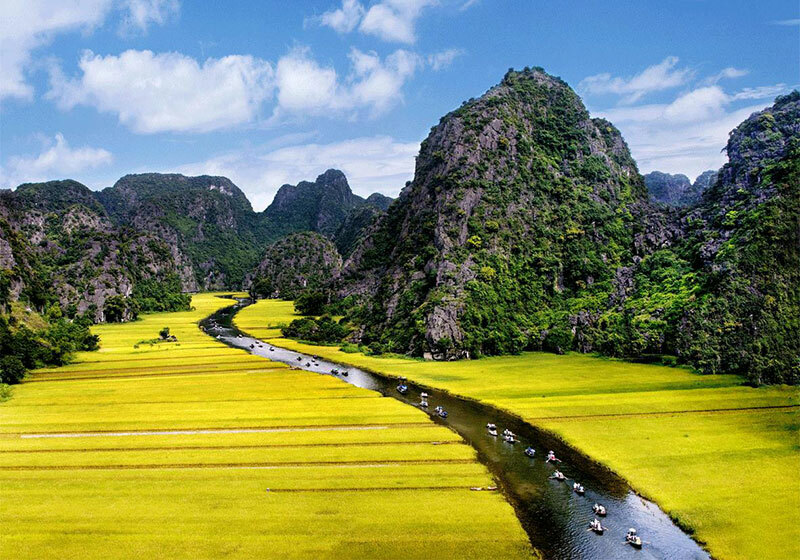 Short Description: Cúc Phương National Park is located in Ninh Bình Province, in Vietnam's Red River Delta. Cuc Phuong was Vietnam's first national park and is the country's largest nature reserve.